Emily Zarndt swore by Barkthins. Zarndt was put out. Not only did she consider it a confusing bit of marketing — what did chocolate bark have to do with the New England dialect? — but even as a relative newcomer to the city, she found the use of the accent trite and overdone. Blame it on the Wahlbergs — or all those Boston-set movies — but lately, advertisers seem to have decided that the only way to win over Boston consumers is by playing up The Accent. On billboards and subway placards popping up across the city, companies peddling everything from bourbon to cold medicine are dropping their r’s in the name of sales. And in a city that’s nothing if not proud, the onslaught has quickly drawn the ire of many locals who consider the practice hackneyed, patronizing, and hopelessly out of touch. “You can’t just slap up ‘Wicked pissah’ onto a billboard and hope to relate to Bostonians,” says Kathy Kiely, president of the Ad Club in Boston, a trade association for New England’s marketing, media, and communications industries. For the record, John McHugh isn’t opposed to some good old-fashioned Boston nose-tweaking; like many, the lifelong Massachusetts resident got a kick out of 2016’s “Saturday Night Live” sketch featuring Casey Affleck as a chain-smoking, r-dropping Dunkin’ Donuts regular. But the incessant attempts to appeal to Bostonians through references to their supposed dialect? The practice of tailoring ads to specific markets has grown increasingly popular, says Doug Gould, an advertising professor at Boston University who also works as a creative and art director; in recent years, advertisers have relied on a variety of regional tropes and colloquialisms in an attempt to forge a connection — injecting a y’all into a marketing campaign in the South, for instance, or using surfer-speak to appeal to consumers in California. The problem, he and others say, is that it’s a lot easier said than done. In many cases, the ads are being produced by agencies based far outside of New England, by creative teams relying upon little more than a quick Google search to try to capture the city’s essence — so it’s no surprise, perhaps, that things don’t always go well. 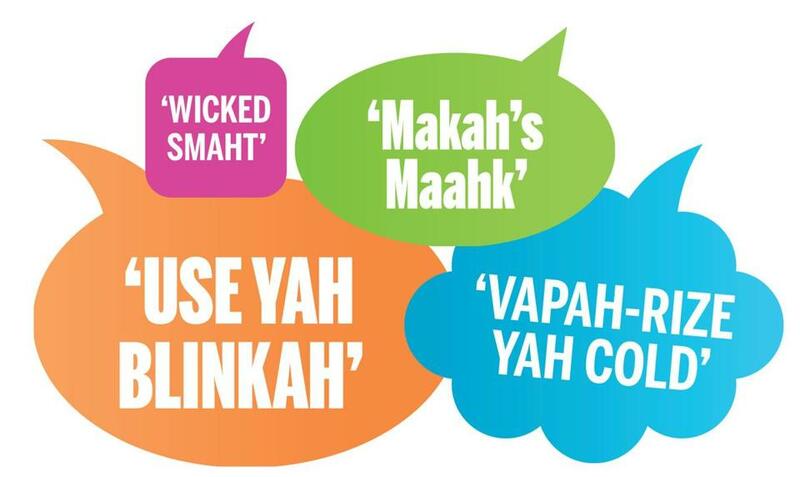 Having studied linguistics at the University of Sydney in Australia, Bibek Gurung took particular exception to the DayQuil ad, which he said altered a word — “vaporize” — that Bostonians don’t even pronounce differently. “It makes me roll my eyes,” says Gurung, a 27-year-old who works in marketing and communications in Boston. One ad commonly held up as a successful use of the accent was last year’s “Be a Masshole,” a video spot in which a tough-talking man at a bar urges citizens — in a profanity-laced dialect packed with Boston references — to support transgender rights. The ad drew a warm reception in advertising circles. Still, the folks behind it were understandably nervous about how the public might react. At the end of the day, says the Ad Club’s Kiely, it comes down to authenticity. When she was starting out in the business years ago, there was a popular industry creed: You don’t have to be a dog to write a dog food ad. But in today’s world, where increasingly savvy consumers can snuff out disingenuousness — and outsider pandering — quicker than ever, she’s not quite sure the old adage holds up.